HKU Legal Scholarship Blog: Was it Lawful for the Police to Use Tear Gas on Protesters in Hong Kong? What legal authority did the Hong Kong Police Force have to use multiple rounds of tear gas/smoke on protesters who were occupying Admiralty on 28 September 2014? There are no legal provisions that authorise the specific use of tear gas by law enforcement agents. The police must rely upon general powers in the Public Order Ordinance (Cap. 245) (POO) or the Criminal Procedure Ordinance (Cap. 221) (CPO). Section 17(2) of the POO provides that any police office of or above the rank of inspector may disperse any public gathering if he reasonably believes that the gathering is likely to cause or lead to a breach of the peace. To carry out this power, a police officer (of or above inspector rank) may give or issue such orders as he may consider necessary or expedient, and police officers may then "use such force as may be reasonably necessary" to disperse the public gathering. Section 45 of the POO reiterates that any police officer "may use such force as may be necessary" to "prevent the commission or continuance of any offence under this Ordinance", to arrest, and "to overcome any resistance to the exercise of any of the powers conferred by this Ordinance". As a restriction on the use of force, it is provided that "the degree of force which may be so used shall not be greater than is reasonably necessary for" the purpose of dispersing the public gathering (s. 46(1)). Finally s. 101A(1) of the CPO confers the general power to "use such force as is reasonable in the circumstances in the prevention of crime", but this provision does not appear to add more to the powers under the POO. However, to confer immunity on the police, s. 46(3) of the POO provides, "Any person who uses such force as may be necessary for any purpose, in accordance with the provisions of this Ordinance, shall not be liable in any criminal or civil proceedings for having, by the use of such force, caused injury or death to any person or damage to or loss of any property". I highlight the qualifying words "as may be necessary...in accordance with the provisions of this Ordinance". Thus the immunity will not apply where the reasonable necessity test cannot be met. In this regard, it is important to note potential criminal liability under s. 22(1) of the Firearms and Ammunition Ordinance (Cap. 238). Under this provision it is an offence to discharge any arms or ammunition in a manner likely to injure, or endanger the safety of, any person or property or with reckless disregard for the safety of others. The definition of "arms" includes "any weapon for the discharge of any noxious liquid, gas, powder or other similar thing" (s. 2(1)). Lawful authority and reasonable excuse are available defences, but these issues will largely turn on whether the police had used necessary and reasonable force. Another issue for clarification is whether any of the tear gas/smoke used contained chemicals listed in the schedules of the Chemical Weapons (Convention) Ordinance (Cap. 578), which makes it an offence to "use a chemical weapon" (s. 5(a)). Thus in deciding whether the police had legal authority to use tear case, the central issue is going to be whether the use of the tear gas was a degree of force "greater than" was reasonably necessary in the circumstances at the time. In assessing this issue, it is important first to consider what guidelines and policies the police have adopted governing their use of tear gas in the public protest context. The guidelines are important for two reasons. First, they can be judged on their face to see if they contain sufficient strictures to comply with a reasonable necessity standard. Second, if the guidelines are satisfactory, the actions of the officers on the ground can be assessed for compliance with the guidelines. Beyond these guidelines, a court will likely apply proportionality reasoning as developed in Hong Kong's established human rights jurisprudence. Whether there were less intrusive means to achieve the same objective would be relevant here (HKSAR v Hung Chan Wa (2006) 9 HKCFAR 614, ). "Public order events held with or without prior notice given to the Police would be handled in accordance with established mechanisms and having regard to the specific circumstances of the case concerned. When there was a breach of the law, the Police would, first of all, advise the persons concerned to comply with the law. Warnings would be given where necessary. Where the situation did not improve and there was a need for the Police to take resolute actions, clear instructions and warnings would be given and adequate time would be allowed for the persons concerned to comply with the instructions. Regarding the use of force, it would not be used unless it was really necessary and the force used would be of minimum level to achieve its purpose." From this one can derive the following list of factors relevant to assessing whether it was reasonably necessary for the police to use tear gas: (a) was only the minimum level of force used; (b) were sufficiently clear warnings given on each occasion; (c) was adequate time allowed on each occasion for the persons concerned to comply with the warning; (d) what was achieved by the means; (e) were less intrusive means reasonably available to achieve the same ends; (e) did a senior officer, who was present at the time, authorise each use? While all the facts will need to be considered carefully before coming to any firm view, the scenes from the televised coverage showed (i) no clear acts of violence or rioting that necessitated the use of the tear gas - suggesting an excessive response, (ii) repeated uses of the tear gas appeared to surprise protesters - suggesting that either an inadequate warning was given or insufficient time was allowed for protesters to comply, (iii) throwing of tear gas canisters directly at protesters or into crowds - suggesting that not the minimum level of force was used, and (iv) quick regathering of protesters (after momentary dispersal) - suggesting that the tear gas achieved very little and certainly nothing that less intrusive means could not have achieved. Thus it seems the Hong Kong Police Force have more than a clear case to answer to justify their use of force on the protesters. Written by Simon N.M. Young. (i) Are you sure you watch TV? There were scenes clearly showing that protesters attacked police. (ii) Tear gas is released via an explosive pop, and there is no set location where the tear gas canister is to be thrown. Repeated warnings that tear gas will be deployed does not quickly diminish its inherent element of surprise that triggered the reactions seen in the protesters. It seems that you are the one who did not watch TV, and nor were you at any material time in close proximity to the protests. There are numerous TV footages showing policemen throwing tear gas canisters with their bare hands at peaceful protestors. Go and google it instead of commenting here without knowing the full facts. As for protesters attacking the police, it was well within the powers of the police to arrest the individuals responsible. I, for one, was not aware of any intentional assault on any police officers. Feel free to show me evidence to the contrary. Whatever did or did not happen, however, the police cannot use that as an excuse to deploy tear gas against the wider mass of protestors, 99% of whom were peaceful and were not doing anything to provoke the police at the time. Again go google it and search for footages of the time when tear gas was used by the police. I googled. Did you? Don't tell me your news sources are Apple Daily or Passion Times, which are just about as censored as mainland media is. Have you not seen footages of protesters hitting police, throwing things at police, and jabbing at police with whatever they had? I agree that the majority were protesting peacefully (and unlawfully), but the minority that chose to attack police was enough to necessitate the use of pepper spray. The fact that the protesters came prepared with plastic wrap on their faces suggests that they were prepared to put up a fight. On the use of tear gas, tear gas is used to disperse, not to injure. And, the use of tear gas was not without plenty of warning to the protesters that were occupying the space illegally and that tear gas would be used. Why are they even complaining? The protesters refused to leave, knowing very well that they were breaking the law. The protesters do not need to start a riot before the police make them leave. No, I watched TVB news, which some people say are pro-govt or pro-china. Anyway, I agree some protesters at the front were pushing and shoving and some small minority may even have physically barged into police officers (or you may call this an attack). It was well within the power and authority of the police to make arrests. Indeed they should. What was wrong was for the police not to arrest the people responsible for these "attacks", but to use tear gas indiscriminately at the protesters at the various locations. 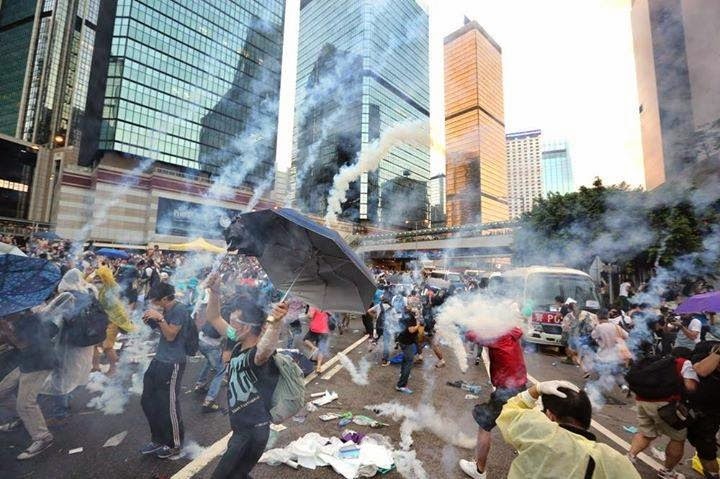 I would be interested to hear what you have to say on the police using tear gas at the crowd in Chater Road. Go google it if you have not seen it. In case you think I got my take on what happened there from Apple Daily or Passion Time- No I did not. Also the police continued to use tear gas at the protesters outside the Govt HQ when all the pushing and shoving had ceased. One needs to look at the manner in which the tear gas was used to determine if it was justified or not. If its use was limited to dispersing the crowd who was pushing and shoving, then it may have been justified. If you do not understand this, think of it this way. It is lawful for a police officer to use proportionate force when exercising its policing powers. However, it cannot be lawful for a police officer to use force continuously on someone (whether a suspect or not) without the intention of exercising a legitimate policing power (e.g. arresting a suspect). Outside the Govt HQ when tear gas was deployed, all I could see was the police firing tear gas indiscriminately, but there were no visible attempts to arrest any suspects (and there were only some half-hearted attempts to regain control of the roads). The continued use of tear gas in these instances was excessive and could not have been justified. Lastly, I do not understand your point about protesters wearing cling film or other protective gear. It was well within their rights to do so, and, in itself, they do not suggest that the protesters "were prepared to put up a fight" as you say in your reply. If your logic were to be right, then the police would be well justified to fire their guns at protesters wearing gas masks and bullet proof vests. The use of force by the police has to be proportionate, and that measurement is to be made having considered all the circumstances. Using tear gas at the protesters charging the Govt HQ may have been justified, but the police did not. Instead, they chose to use tear gas on mostly peaceful protesters. This was clearly and indisputably wrong and unlawful. If the police had decided to employ the use of more force than just tear gas, then it is obvious they would have been able to achieve their objectives more effectively. That suggests that tear gas was LESS than the minimum necessary to achieve their goals. Mate you must be living in haha-land? Use more force than just tear gas? Like what? What about shooting all the protesters with a heavy machine gun? Ok, even if the police did that, I wasn't sure if they would have managed to clear the scenes, bearing in mind the number of people occupying Gloucester Road (which would seem to be more than 10-20k at all times during the time when tear gas was used). At this rate the police would probably run out of bullets. The fact that the police failed to achieve whatever objectives they had in mind yesterday was a clear sign that their leadership was ineffectual and even incompetent. well at least i got back to work this morning. the police did their job well enough. Thank you for opposing people saying protesters were obstructing the society. Even if they couldn't disperse all the crowds, they had to have the important areas under control. You do realise that there were protesters trying to charge through police lines, and that there were protesters wanting to enter government buildings? If the situation had run out of hand, China would have a reason to deploy the PLA -- they have a garrison sitting right in Admiralty. On the contrary, I would say that if the police had failed to disperse all the crowds, it was because they hadn't taken more action to remove protesters intially. Plus, dispersing an entire crowd with numbers on the order of 10,000 with tear gas is obviously not realistic. HK police are one of the most lenient in the world. Take a look at protests in other well-developed places, e.g. G20 summits. Police in other countries chase down protesters with police batons, without so much of a "Please leave before we use tear gas" warning. I think you'll need some commas in your sentence, because it can be interpreted in two ways. => where does it say the use of tear gas is to be necessitated by "clear acts of violence or rioting"? => I guess being surprised is a given if a thing suddenly popped right beside your feet. I personally will be surprised if a cockroach suddenly dropped from the sky and appeared next to my feet. => Yep they certainly should just throw it beside the crowd, and let them watch it blow like fireworks. (iv) quick regathering of protesters (after momentary dispersal) - suggesting that the tear gas achieved very little and certainly nothing that less intrusive means could not have achieved. => So you're saying that while tear gas is ineffective to disperse the crowd, the crowd can be dispersed using less intrusive means...an interesting idea. (i) if you dump a rubbish on the ground, you are clearly violating the law. Can a policeman immediately come and deploy tear gas at you? Why would you need to use tear gas if there was no act of violence or rioting? NECESSITATE is the key word. (ii) If you are warned that a cockroach is going to dropped, and if you do not leave, the cockroach is going to drop next to your feet, what will you do? (iii) What is the use of tear gas? To hurt people or to make people leave? If the latter, I do not think that you are making any sense. (iv) Then tell me what tear gas has achieved. We would then see whether a less intrusive means can achieve the same result or not. Re (1) Tear gas is a legitimate means of crowd dispersion. Barring the fact that necessity is an ambiguous assessment; teargas can very much reasonably be meant for purposes of triggering crowd retreat - and in fact that is what happened when they are deployed. Re (2) Leaving discussions over the practical effects of surprise gasing aside, given the numerous times of releasing teargases, whether they are all surprise attacks is up to question - it is not hard to observe and plausibly conjecture protestors were in fact deliberately ignoring warnings to deploy teargases and perhaps were actively waiting for deployment to respond. Especially when protestors can swiftly attempt to put them out with water or throw them back swiftly as shown in some videos. (iv) Police has always been using escalating measures only in response to ineffectiveness of previous measures. It is important to take note that the purpose of the police force is to contain and disperse the crowd gathered under unlawful assembly or otherwise illegally - in doing so they need protesters to retreat and police to gain grounds. In context, we need to observe the whole day well into the night. Pepper sprays and teargases / riot police are successively used in view of the ineffectiveness of the preceding means to disperse crowds. And when you compare casualties I doubt anyone can say no police members are harmed. In recent years, the HK police force has been consistently one of the most soft-powered enforcers in society. It is an invalid comparison to claim all "weaponless" students as nonviolent when some do climb and charge legco, civic square and erected scaffolding; to claim students with their hands raised while attempting to obstruct police advancing lines as "peaceful" when they are part of a coordinated effort to obstruct the police and occupy public territories. If words do not work, you push; if push does not work, pepper spray; If pepper spray does not work, teargasing. It has always been restraint and discipline that govern Police actions, as if they are not already bearing the brunt of societal backlash and condemnation in face of a population incapable of reading internationally and comparing police approaches in a fair manner. Additionally, few seem to grasp the idea that if HK police does not deal with this quickly, it is strong pretext for even more drastic measures to become available. Given this is a legal Scholarship Blog, I assume we are informed as to the significance of Article 18. The meeting of the conditions on applying national provisions to HK is dictated by NPCSC interpretations and much turns on less predictable political considerations in Beijing. Teargasing is as much a means of crowd dispersion as it is a gesture to reassure NPCSC not to take charge. Whether NPCSC taking charge is a foreseeable and likely outcome is again up to dispute but it is definitely one of the factors the police force took into account in managing Occupy Central. It is saddening to see the leaders of Occupy Central overriding student rhetoric and commandeering the political narratives of different groups. It is a shame to see Benny Tai and his co-leaders sitting on a corner throughout the whole first night of turmoil as they watch from a safe distance "behind the students". You reap what you sow. And unfortunately, we have sowed seeds of further polarization and ever-stronger NPCSC skepticism. Thanks Prof. Simon Young for providing a platform for rational discussion with your legal perspective as the basis. Simon, please stop using the name of HKU Legal Scholarship, the conclusion you draw is subjective. Neither I support the government nor the protesters. When you analyze, you have to accept what you see not just believe. This is by far the best response I've seen so far and good job Simon for ripping lines out of his text books and paste it on his blog. I do not agree with Simon's arguments wholly, but you are no more qualified to talk about law than him. 1) The arrest video of Mr Wong shows absolutely no violent act against the police, only an aftermath. Hardly admissible as evidence in court. Protesters made way for the police to perform the arrest and did not attack while they were later apprehended. By the way, tear gas was not needed to arrest Mr Wong, so you don't have a point. 2) Shouting without charging or making threats is non-violent, and can never be grounds for justifying a violent response from law enforcement. Otherwise the police will have to be condemned for turning a blind eye against the verbal (and probably physical) assault of Hong Kong resident Ms Wai-sze Lam by a mob. Again, I don't see your point. 3a) You don't throw tear gas in Admiralty for something that will happen unplanned in Mong Kok a few hours into the future. 3b) Other protesters urged the perpetrators to stop the violence. 4) Yes, and the attackers were probably arrested. It would have been quite easy. Even if they weren't, that was no excuse to attack the entire crowd - can you shoot the crowd because you don't want to arrest a thug standing in front of them? Thanks Simon. How about usage guideline for pepper spray? What's your point Simon? Is occupying the street not violating the law? Is disturbing order, stopping traffic including ambulances, selfishly decide those big and small shops not enough for the police to clear the scene? I do not object the dedication to fight for what one think is right. However, it should not be at expense of other Hong Kong people's loss, big loss or small loss, it is NOT for the protestors to decide. Simon, thanks for the piece of education. After reading that, it is pretty clear to me that the HKPF has taken the right measures. They might be guilty of not being smart, in fact, painfully stupid. However, one thing is clear. It is legal. Occupying the street is not. Protestors, if you care about Hong Kong so much. Find a way that is not as intrusive please. I am all for it. Simon, last note. Please do not shame HKU. I beg of you. I agree, HKPF had held their lines of protecting and to serve. Occupying the streets in mass numbers and disrupts of order is not a legal act. Sensible critique of the author and his piece. Finally a voice not lost in all the sensationalist rhetoric. At the end of the day, both parties have underlying reasons for their actions. With the freedom of speech under imminent threat, it is natural that the press villainize the HKPF. Although disturbing public order is the basis of which the HKPF carries out their actions upon, the people of Hong Kong would not need to resort to protest if their voices were heard and given what they wanted. The HKPF are just stuck in the middle, trying to do their jobs of maintaining peace and order. How is freedom of speech under imminent threat? The fact that Apple Daily still exists is living proof that freedom of speech is very much alive in Hong Kong. Tear gas was not used on all of the protesters, tear gas was used on the protesters the police were trying to remove. May be folks can talk about why legal action can be pressured against the police unnecessity use of force? Probably doesn't help when protesters were purposely running up to be tear gassed again and again, so that they can claim that the police tear gassed them.